t*rexes and tiaras: A girl can dream..
One of the many things I was spoiled with at my birthday last week was a voucher for a spa day. I went for a spa day with one of my friends last year after the world's biggest panic about swimwear and no doubt this time I will have the same issues. I've been focusing a little more recently on actually making time to relax, as I am beginning to understand how important it is, so I'm really looking forward to getting away for the day. I don't know why but as soon as I check in and am able to take some time out to relax around the hydrotherapy pool and chill out (literally) in the snow room, it's like I totally forget all of the stresses of modern day life. This got me thinking, maybe a spa set up would be something to add to my list of considerations with the house hunt. According to research done by UK Bathrooms, the majority of Brits said they would like to add spa features to their bathrooms and this is something I can definitely understand. It seems to me that it would be more cost-effective in the long run to add some features like a hydrotherapy bathtub or a massaging shower head to the bathroom in the new house. than to book a monthly date with the local spa, so I'm definitely in agreement with the research, which I spotted in ID News. Would you consider a spa set up at home? 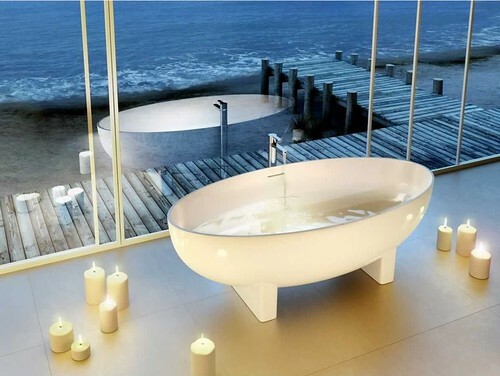 What would be in your dream bathroom? Wouldn't it be great to be able to relax whenever? I'd love a spa set up in my house - unfortunately, I'm lucky to get a bath in the London flats I'm stuck with!! One day I'll have my own home though, hopefully! Ahh, yes. TBH I don't tend to use the bath very often - prefer showers as they save time in the morning, but for relaxing I guess a spa type bath would be best. I do love attending the spa but it would be cool to have some spa like treatments at home too. I am sure in the long run it would save some money. I think it probably would - I'd have to just look at it as an investment. If you're getting some sort of hydrotherapy/jacuzzi bathtub make sure you get a decent one. When we moved into our current house the bathtub had a bubble making facility, and it was the crappest thing I've ever had the misfortune to sit in. We got a new, basic bathtub that just holds water. If you can't get decent stuff at home it's probably more worthwhile to book a monthly spa trip. That's a really good point - I think that often in these situations you get what you pay for. I would definitely do some research before coming up with the design, but it's at least opened my eyes to the possibility of changing things if I see a house I like but I'm not keen on the bathroom. I want one of those big claw foot baths, they always look so grand. Hopefully when we get around to DIY'ing and tearing out the back bathroom (which is just a loo and sink) we'll make it all fancy and relaxing. It's currently stuck in the 70's with the most orange, blue and brown wallpaper. I actually hate the colour scheme so much I tend to avoid it lol. Oh gosh, those are lovely. My current bathroom is pretty pokey, and not that nice. The shower leaks everywhere and I've been considering replacing it with something better, maybe a hydro one. But as I'm not planning to live there much longer and it's only a rental, I've not yet done so. A sea view would be a pretty awesome thing to have. Failing that I'd like a power shower, I know they use loads of water but they are so refreshing and invigorating. I'd very much like a sea view some day. I only have a shower SOB! I miss watching netflix in the bath and topping up the hot water for hours. The last bath I had was with Sookie haha. She had gotten so dirty and refused to get in the bath to be washed down so I had to sit in it with her and then clean the bath and have my own bath after that. She's such a little madame. I don't often have baths at home because the water is so unrealiable at my house.